At Irvine Oral Surgery, we have created a world-class oral surgery practice in Orange County specializing in a wide variety of problems relating to the mouth and facial region. Extensive training is the cornerstone to providing exceptional care to our patients. Dr. Hsu & Dr. Nguyen underwent six additional years of hospital based surgical and anesthesia training to become oral and maxillofacial surgeons. Both Dr. Hsu and Nguyen are dual degreed oral surgeons, licensed to practice oral surgery and medicine. 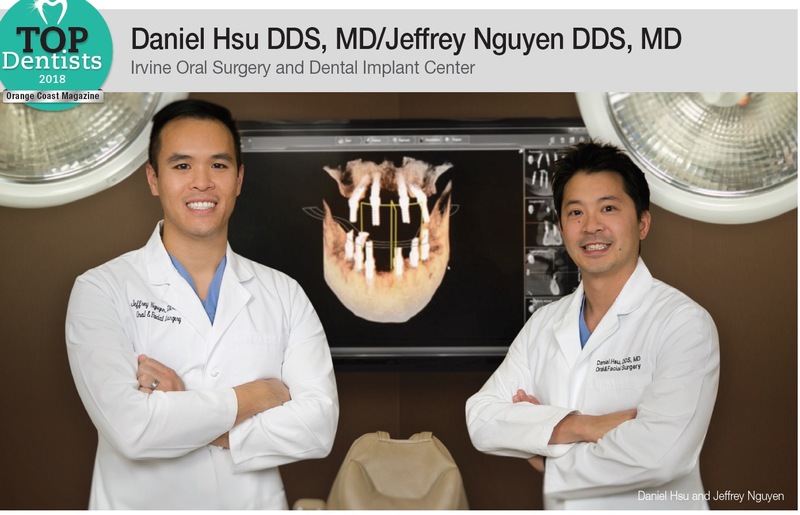 Dr. Daniel Hsu & Dr. Jeffrey Nguyen practice the full scope of oral and maxillofacial surgery with expertise ranging from facial trauma surgery to corrective jaw surgery and wisdom tooth removal. They can also diagnose and treat facial pain, facial injuries and TMJ disorders, and perform a full range of dental implant procedures. You will feel comfortable in our beautiful and state of the art facilities. Irvine Oral Surgery is committed to staying up to date with the latest techniques and procedures. Digital Panoramic x-rays to minimize radiation to the patient. Building a foundation of trust by treating our patients as special individuals is vital to our success. We understand how uneasy some patients may feel about oral surgery, and how we can make a difference in providing a relaxing and positive experience. Our entire team is dedicated to providing you with excellent, personalized care and service to make your visits as comfortable and pleasant as possible. For those fearful patients we offer a variety of anesthesia options including nitrous oxide, oral sedation, IV Sedation, and full General Anesthesia. We thank you for allowing us to take care of your oral surgery and dental implant needs. We look forward to serving you. Make an appointment today…..we are looking forward to serving you! VISIT US ON YELP !